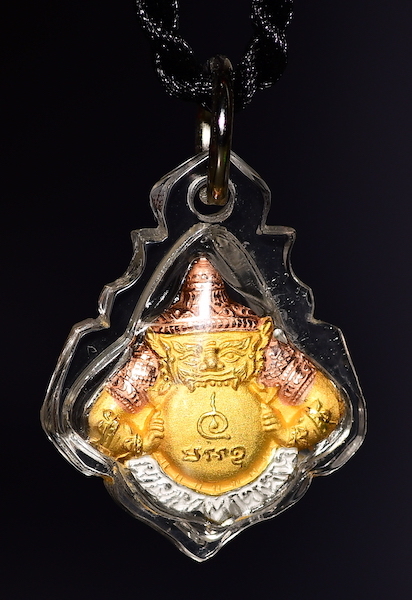 Colorful waterproof RAHU amulet with Phra Phrom on the reverse side. Rahu is of Hindu origin. It is usually seen in a black magic sense, eating the moon. On the reverse side is Phra Phrom, the Buddhist interpretation of Shiva – with all knowledge, the god of everything… the protector of all. Rahu is the Hindu god that is featured in many Buddhist amulets – especially Jatukam amulets and others concerned with black magic or other supernatural powers. Rahu is typically pictured eating the sun or moon. Here he’s doing just that. The moon is gold – signifying money as no object. There are Pali language symbols arranged auspiciously around Rahu. At the bottom of Rahu’s head is a white curve of teeth. Rahu is Hindu, but the Buddhist texts mentions it as well. Rahu is mentioned in 2 different stanzas from the Samyutta Nikaya of the Pali Canon (large Buddhist text). This is a highly detailed (probably our most detailed) Rahu amulet, front and back. Reverse side shows the 4-headed Buddha (Phra Phrom) in tri-color, and also highly detailed design. Phra Phrom (Thai: พระพรหม; from Sanskrit: Brahma, ब्रह्म) is the Thai interpretation of the Hindu god Brahma (the god of everything). Phra Phrom is thought of in Thailand as a god of good fortune and protection from evil. Phra Phrom has 4 faces, each facing different direction – north, south, east, west. It means he has knowledge from all directions. We have a few of these amulets, please order quickly if you want one. We probably won’t find this exact amulet again.